We present a new technique for generating sets of stratified samples on the unit square. 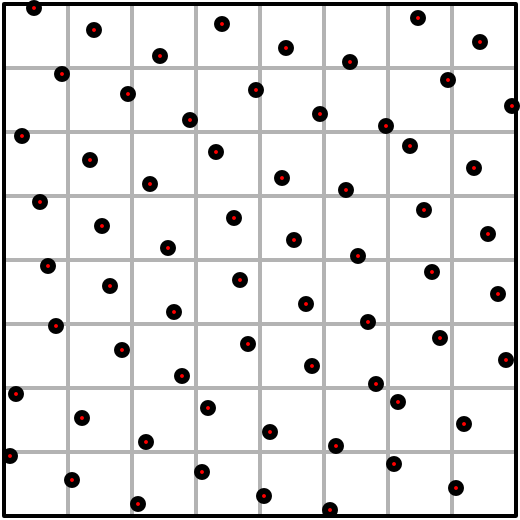 Though based on jittering, this method is competitive with low-discrepancy quasi-Monte Carlo sequences while avoiding some of the structured artifacts to which they are prone. An efficient implementation is provided that allows repeatable, random access to the samples from any set without the need for precomputation or storage. Further, these samples can be either ordered (for tracing coherent ray bundles) or shuffled (for combining without correlation).